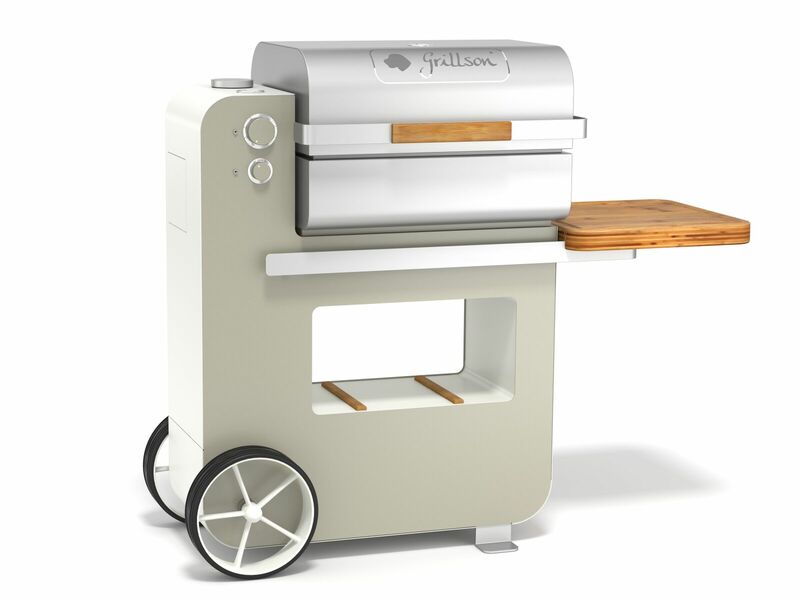 Grillson pellet smokers and grills take outdoor wood fired barbecue cooking to a different level in design, quality construction and cooking technology. 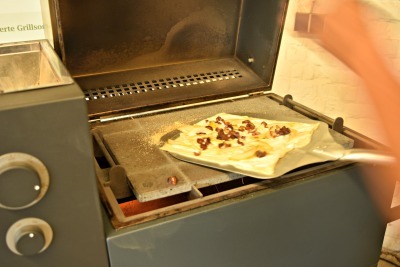 The only wood pellet grills that deliver the high temperatures needed to truly sear a steak (using direct heat) and bake a pizza. 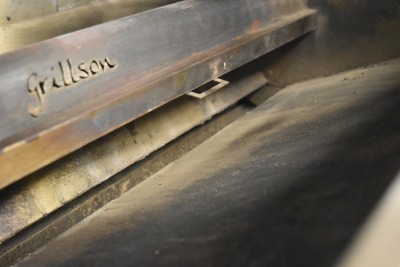 When you think about a pellet smoker or grill it's fair to say that Grillson is probably not the first name that's going to trip off your tongue because these types of grills have been the preserve of American companies such as Traeger and Green Mountain Grills. In 2010 the German manufacturer Grillson came on the scene and in 2014 pioneered the use of mobile app technology for cooking control and most importantly they fundamentally changed the pellet burning technology that underpins the performance of a pellet smoker / grill. There are just two models in the Grillson pellet smokers range both designed to appeal to a distinct customer demographic although neither of which could be described as the "budget" market. Bob Grillson - Sleek lines, a higher powered burner, WiFi control via mobile app, battery operation and two meat thermometer probes*. Leif Grillson - The young pretender with more angular lines comes with all the same thermal attributes and cooking grate size but with a slightly lower powered burner and fewer remote control options. (Leif Grillson Premium includes WiFi control via mobile app battery operation and two meat thermometer probes*). *Top of the range "S" models feature wireless probes. They have to be the most beautiful barbecues that I have ever seen. The first thing that I noticed was that the patented burner technology is completely different to any other on the market. 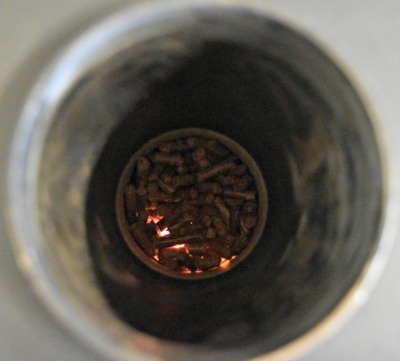 Pretty much all pellet burners use an auger to feed pellets to a central fire pot sited under a baffle plate. The fire pot is where the pellets are burned to produce both smoke and heat which is then distributed around the food chamber to cook the food. Between the fire pot and the food rack is a baffle plate (a solid tray of metal) which in conjunction with the air flow system protects the centre of the food chamber from developing a hot spot. It works... to a greater or lesser extent. 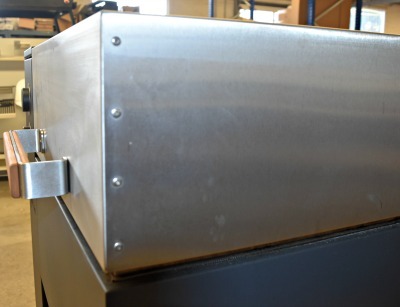 The main complaint is that the conventional pellet smoker exclusively delivers convection heat to the food chamber, great for smoking but compromising its use as a grill. 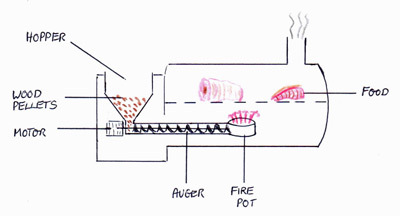 The flow diagram below demonstrates how the burner technology in Grillson pellet smokers is a significant improvement for even distribution of both heat and smoke. Fire radiates from the burner into the diffusor. 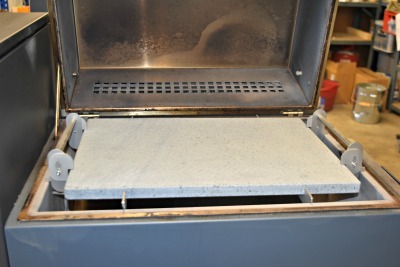 The diffusor produces radiation and convection heat in the grill area. Radiation heat is delivered from the diffuser directly to the grill area. It doesn't get better than this. 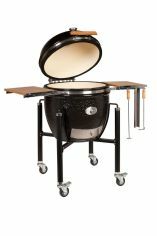 Grillson pellet smokers arrive fully assembled on a pallet so all you have to do is lift one side, wheel it off the pallet, insert the diffuser, cast iron grill grates and plug it in. The wood pellets come in sealed 20lb (9.07Kg) bags and it's important that once opened your wood pellets are kept dry. As you'd expect, Grillson make airtight containers specially for this purpose. Once plugged in, to start you switch on the Grillson by lifting the grill lid, turning the temperature dial and looking down the hopper to check that the glow plug is working. The Grillson patented burner technology drives a massive wedge between it and any other pellet grill / smoker on the market. You'll struggle to take a regular pellet grill over 250°C (480°F) but thanks to the burner technology and the double skinned insulated food chamber Grillson temperatures just keep climbing. So to test overall thermal performance I just had to go for steaks and pizza. The diffuser has a handy U shaped sliding gate on it so that you can differentiate between direct heat and indirect heat. Move the gate halfway down the diffuser, the left side (closest to the burner) delivers direct heat and the other side offers excellent convection heat. On this occasion I had the diffuser gate fully open because I wanted to test direct heat quality right across the cooking grate. 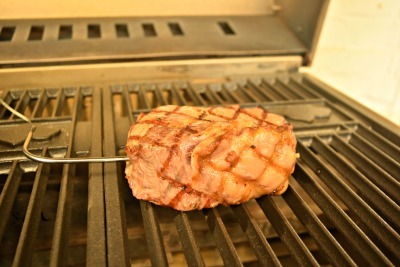 The grill grates are triangular in cross section in theory to attract as much heat to the flat underside and to concentrate it in the pointed top side to deliver good sear marks. Well it certainly ticked that box. Just over the 20 minutes and I had my test Grillson up to 350°C (660°F) using the standard diffuser. (There is also an optional perforated diffuser that allows more direct heat through to the food chamber). Two minutes on each side delivered a good crisp caramelisation to the exterior and a supremely juicy and flavourful steak. Note: The smoky flavour was delicate and this is because the hotter the grill, the more complete combustion and therefore the less smoke. 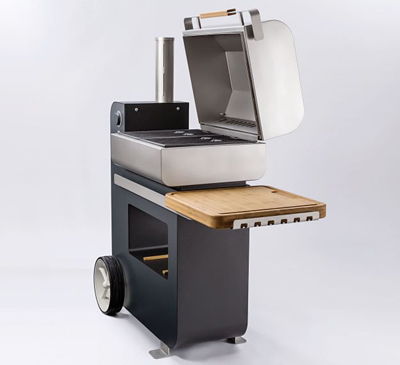 As I said at the top, Grillson pellet smokers come fully assembled so none of the frustrations of having to build the cart, it's pretty much as simple as plug it in and you're ready to play. Battery operation is also possible on Premium models, open the side door where the control panel resides and you can insert and connect up a leisure battery. (A 110Ah leisure battery will deliver approx. 14 - 15 hours cooking time). One gripe I have with Bob is that the standard sized pellet hopper is only 2Kg giving about 6 hours smoking time. If cooking pulled pork for example then you're going to need to refill the hopper. Note: The hopper won't run dry on Premium models because the a pellet alarm notification is sent to your smart phone. In addition Grillson have now produced a larger hopper but it's only available as an option at extra cost. The extra large pellet hopper for Bob holds 7Kg of pellets which is enough to cook low and slow for 21 hours without refilling. Leif however doesn't suffer from the same problem. With a hopper capacity of 5Kg you have approximately 15 hours low and slow cooking time between refills. I got the impression that one of the benefits of buying Leif is that it has design improvements built in. Other negatives for me include the lid which is heavy. You don't need to pump iron every day to lift it and you do get used to it but it can be a shock the first time lift the lid. Lastly grill space isn't massive. At 373 square inches of grill surface it's not going to be the right choice if you're into large cookouts and even for my testing purposes I would have liked the warming shelf to have been a standard feature rather than an option. No arguments here and this is where you see the advantages of the heavy lid versus the flimsy lids found on most cheaper pellet grills. Inevitably there was a loss of temperature when I opened the lid but the return to my pre-set temperature was swift when I closed the lid. Likewise temperature fluctuation during cooking was minimal although I noted that the best regulation and monitoring of the temperature is by the dial and app, not by the lid mounted thermometer. My test facility didn't allow me to test absolutely for any changes in fuel consumption at lower ambient temperature but I think it's is safe to say that Grillson pellet smokers are going to perform consistent with the laws of insulation and thermodynamics so grilling into the Autumn and Winter is a distinct possibility... and thanks to Wi-Fi I don't need to continually go outside and check the temperature! 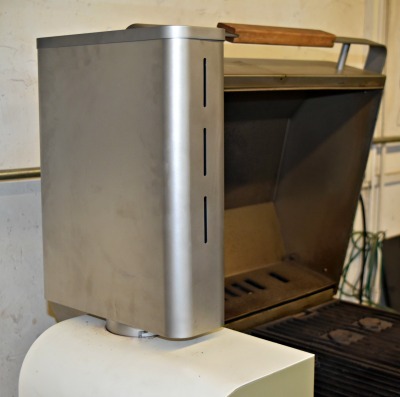 Grillson pellet smokers were the first to introduce a cell phone app that can control the grill through Wi-Fi. There are upgrades coming for 2019 to improve the app but what I saw was pretty impressive and available for both iOS and Google Play. Minimum requirements are iOS 7 and Android 4.4 KitKat. The Wi-Fi kit comes as standard on the Bob and Leif Premium models but if you've got one of the standard models then you can buy a kit to upgrade. It costs slightly more than buying the Premium model off the shelf but it's pretty simple to make the upgrade at a later date if you can't justify the expense first time around. 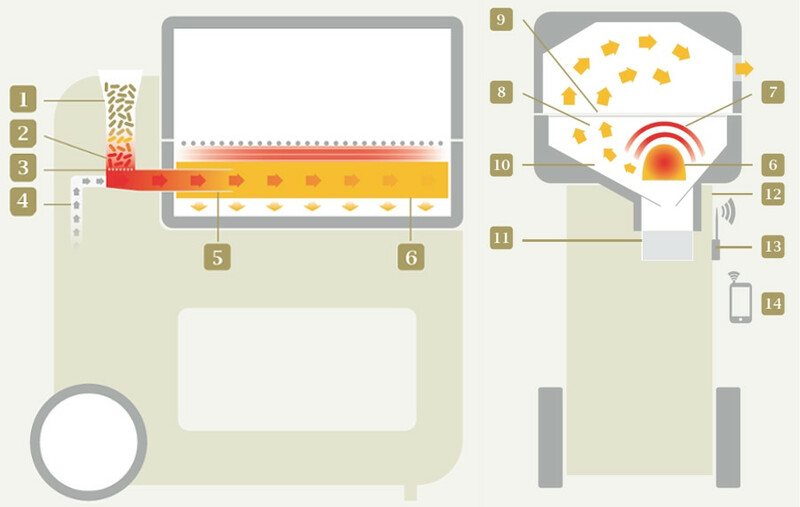 Activating the app simultaneously de-activates the dial control on the front of the grill. I used the app to do a 2 zone trial on a hunk of beef. Setting the app by selecting the type of meat (beef, pork etc. ), the cut of beef and lastly how I preferred it to be cooked. The wired probes are fed through the vents at the back of the lid. To go completely wireless, choose the Grillson Premium "S" models. To finish the beef off to perfection I used the "ramping" feature on the app. This gradually minimises the heating power as you get close to the desired temperature so making sure that your meat is done absolutely to perfection. I'm happy to report that the ramping function works! I found the user instructions for installing the app to be a little complicated but that maybe because I'm over 50! So to be on the safe side I've written my own version of how to install the Grillson app. Note: In years to come I think that a wireless app is going to be pretty much entry level to the pellet grill market and moreover something that is going to make ardent gas grillers stand up and take notice. 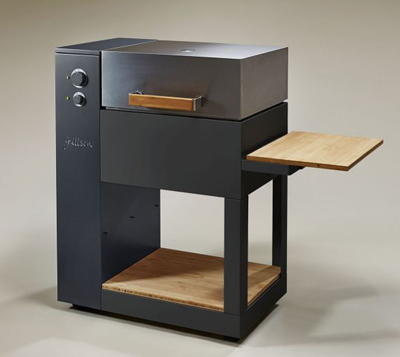 A few seasons ago I wrote about the arguments for charcoal versus gas and whilst I've always preferred to play with charcoal you can't argue with those who have always preferred gas for convenience and cleanliness... but then a pellet grill like the Grillson gives convenience, cleanliness and wood flavour. Food for thought. There's no shortage of smoky flavour when it comes to low and slow indirect cooking on Grillson pellet smokers using the optional smoke diffusor. Remove the standard diffusor and replace it with the optional smoke diffusor, fill it with the pellet flavour of choice and you're ready to smoke. In order to remove and fit a different diffusor all I had to do was remove the grill grates and then the diffusor is right in front of me. I had to choose from 14 different pellet varieties and plumped for one of their top sellers, "Mexican Heat". I hate cleaning grills at the end of a cookout. 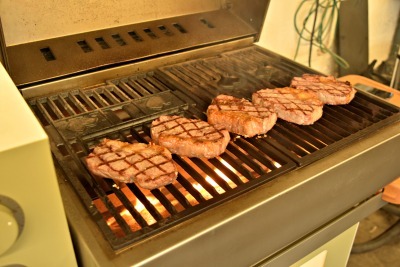 It certainly influences my choice of barbecue that I use at home and it is one of the reasons why I steer clear of gas so I was intrigued by the cleaning function of the Grillson. 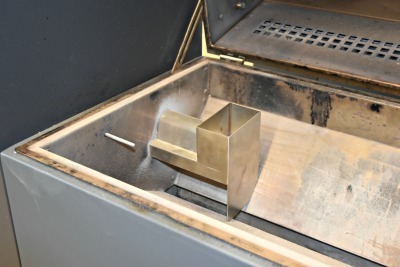 Also a great way to burn off any left over pellets in the hopper, all you have to do is turn the control to "Clean" (or use the phone app) and your Grillson cycles up to 500°C (930°F) and any sticky debris remaining on the grill grates simply pyrolyses leaving a simple wipe down with a cloth. Gas is a fossil fuel whereas wood pellets (and charcoal too) are from a sustainable source and this may be important to you. Whether you source your electricity from fossil fuelled power stations or renewable sources is up to you. When searing I found that 1Kg of wood pellets lasts approximately 1 hour and when smoking low and slow I could get 3 hours out of the same amount. The warranty is comprehensive and impressive. Touch up paint available if you accidentally scratch the painted steel surfaces. The range of accessories is compact yet focused directly on getting the most out of the Grillson. Given that Grillson is the only pellet grill / smoker I know of that you really can take up to a satisfactory pizza cooking temperature, the most notable accessory unsurprisingly is the pizza set. Remove the cast iron grill plates and replace with the key feature of the pizza set - an almighty slab of Sicilian lava rock. Seated in it's own cradle the solid lava rock pizza stone is easy to insert and remove. After the steak I thought a nice dessert pizza would be a good way to finish off the Grillson road test and this time I used Leif. The Grillson pizza set also includes the pizza peel and I've no complaints about the quality of the pizza cooked. Moreover the Sicilian lava stone retained it's heat extremely well, significantly better that the pizza stone that I have with my Monolith ceramic grill so I could roll out pizza after pizza without having to wait for the stone to regain heat. There are also 9 flavours of pellets for use directly in the burner and a further 5 varieties for use directly in the optional smoker attachment. I didn't get to use all of these but I was particularly intrigued by the garlic pellets and would love to try these next time. I've extolled the virtues of Grillson pellet smokers in terms of their beauty on the eye, technological innovation, thermal performance and cleanliness but one thing you can't get away from (and it applies to all pellet smokers and grills) is that there is a background noise when in use. Imagine the rumbling noise that's emitted when you fan (or use bellows on) an open fire. It's a constant noise whilst in operation. Grillson have developed a silencer to fit on the burner exhaust, it doesn't eliminate the sound but it reduces it to a more acceptable pitch. Grillson pellet smokers are tested with water canons to ensure that they are safe to use in the rain. That said it is still important to ensure that your electricity is supplied through via an approved outdoor safety socket. From a thermal perspective I was pleased to note that the lid was still safe to touch when I was searing steaks so no chance of a burn. And I guess this is also a positive argument for the heavy lid that it prevents little hands and fingers getting too close to the hot grill grates. Without doubt this is the best wood fired pellet grill / smoker that I have had the pleasure to test. In terms of convenience, cleanliness, thermal range and performance it ticked all of the boxes and then some. There's a lot said about the excellent quality of German design and manufacturing, Bob and Leif Grillson pellet smokers are another shining example. What's The Difference Between Bob And Leif Grillson? Bob is the original design and first launched with good success but Grillson have understood that in order to broaden appeal and attract larger following of Grillson pellet technology they needed to produce a more affordable model and Leif is the result. Bob is available in two colour schemes, black / anthracite or pure white / lime green. Leif is only available in the black / anthracite colour combination. On close inspection you can see that the design lines of Leif help lower the manufacturing cost but after that the only other significant difference is a lower powered burner. In addition, the lid is double skinned (same as Bob) but not insulated. These changes make for a small difference in warm up times and slightly lower top end temperatures when in clean mode. The UK appointed retailer for Grillson pellet smokers is BBQ Barn in London. For Ireland, go to A Room Outside. For our international readers Grillson have nominated distributors in many parts of the world and the best place to start is the Grillson pellet smokers website. Learning how to install the Grillson app was a technological challenge for me not because the instructions are unclear, just that I like to understand what's going on during each step. If you manage to do it first time from the Grillson instructions then I applaud you but if your less gadget minded (like me) then hopefully my guide will help. Well even I could manage this bit so I will assume that your can find the latest version of the Grillson app in your Apple store or Google play. Note: Your phone operating system needs to be 2016 generation or more modern for the Grillson pellet smokers app to work. The other assumption is that you are within range of your WiFi local area network. In addition you also know the name of your network have the security key code to sign into your WiFi network. Turn your Grillson on and ensure that the WiFi antenna is screwed in. Go to your phone settings (not the app settings), select WiFi and you should see "Grillson P00xxxxxx". Select this and you should see a status "Grillson P00xxxxxx connected, no internet"
That's good. It means that your phone is connected to your Grillson. Note: All Grillson pellet smokers come with an easy to access factory reset button. If your phone cannot recognise your Grillson, open the side compartment to on your Grillson to reveal the electronics, loosen the wing nut and remove the protective metal plate to reveal a small white button. Press this button (while the grill is switched on) for about 5 seconds and the factory settings will be restored. This should resolve the problem. You now connect your Grillson to the internet via the Grillson app. Click on the app and select the dashboard (bottom left) speedometer icon. In the status box at the top you may find that the first line states Grill - connected in green. If this is the case than fine but if not don't worry, just select settings in the app (bottom right) and go to the Login section. Ensure that the IP address switch is set to off and press "apply". Now go into the Login again and you will see Grillson in the "Grill Name" dropdown box at the top. Select this and then press apply again. If the Grill Name box doesn't populate immediately go through the process again, toggle the IP address switch a few times and then press "apply". If you still have no luck then your probably working (like I was) with a smartphone manufactured earlier than 2016. Once this set up is complete select the WiFi settings button in the Grillson app. Search and select your WiFi network and key in the security code twice. Press "apply". You will receive a message that states "not connected to Grillson....", don't worry, this is normal. Exit the Grillson app and return to your phone settings. Select WiFi and connect your phone to your WiFi network. Now open up the Grillson app and your should find that the Grill status in the dashboard (bottom left icon) is green. If not, go to the settings (bottom right icon) and select the Login, click on Grillson in the drop down box and press "Apply"
Continue in the app settings to the "push notification" setting and select "on". Now you're ready to cook! The second right icon (looks like a steak) is where you set the core temperature that you want for your specific cut of meat. Note that some of the meats have not been translated into English but once you've worked out that Chicken is Hähnchen then you're on your way. The central button with the Grillson Pellet Smokers "dog" emblem is where you set the oven temperature and the countdown timer. The second left icon is the sharing section - I'll let you enjoy this bit on your own!